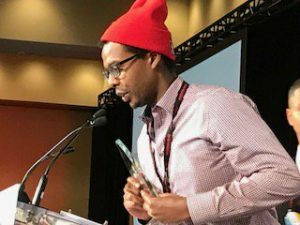 Kumsa Baker, a research analyst with UNITE HERE Local 75, was awarded the 2017 Ontario Federation of Labour’s Young Workers Award at the Power ON convention in Toronto. Baker is just 24, and is part of a new breed of fellow like-minded campaigners in Local 75 that is working to open and expand the union to a new generation of activists. The young leader joined the labour community as a union shop floor leader his local, which represents more than a thousand mostly young food service workers at Toronto’s Rogers Centre Arena. Since joining the Ontario’s labour movement, Baker has been integral in engaging UNITE HERE with the fight against Islamaphobia across the GTA. He also worked with the Fight for $15 and Fairness, which has been central to several successes, including the university food service strikes last winter. The food service workers won contracts to cover almost two thousand workers – 1200 of whom are young workers – at the Rogers Centre. They won a raise in their wages to $15 an hour. These victories demonstrate that employers in traditionally low-wage sectors of the economy can make the move to $15, despite their resistance to doing so. Baker is using his voice within the trade union movement to make change for his generation. At the CLC’s young workers’ meetings in Ottawa, Baker was one of the young leaders who demanded that Prime Minister Justin Trudeau have a stronger vision for the working lives of young people in the future, gaining national attention. Today, Baker is a researcher with his local union where he provides workers at his former stomping ground (Rogers Centre) with the tools and information they need to succeed in the workplace. He continues to organize in the community as part of the Fight for $15 and Fairness and as a powerful voice for young workers across Ontario.